Since the day All Creatures Small Animal Hospital opened, we have only carried the best one line of dog and cat food. 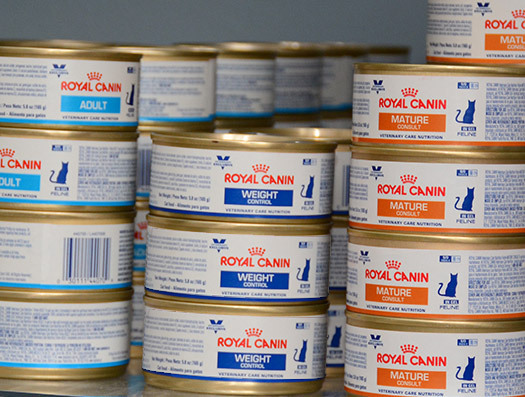 We strongly believe in ROYAL CANIN brand foods and carry their complete veterinary line. Their Early Care dog food takes into account the five identified areas of preventative care: gastro-intestinal, osteo-articular, skin, urinary stones, and tendency to become overweight. The Early Care cat foods address the different life stage and needs: growth, post neuter/spay, and mature. Growth is easy on the gastro-intestinal and highly digestible; the Young Adult concentrates on lean body mass and urinary health; and the Mature tends to joint support and phosphorous control (kidney health). Royal Canin also has the most advanced lines of prescription veterinary diets. These include urinary, kidney, diabetes, gastro-intestinal, hypoallergenic, and many more. Dr. McSweeny’s pets have been on these diets for the past 14 years and all have lived a long healthy life. ROYAL CANIN’s unique approach to the development of nutrition focuses on nutrients instead of ingredients and makes no concessions to anthropormorphism. They combine the precise amount of required nutrients for each pet in a single diet and satisfy nutritional objectives that relate to your patient’s size, age, breed, and physiological stage. Their ROYAL CANIN Research Center in France and their Waltham Centre for Pet Nutrition in the United Kingdom are sources for innovative research including their well-known palatability and digestibility clinical trials. They also sponsor and support a variety of nutritional research projects in the United States in private practice and academia. We know you have many options when choosing the appropriate nutritional solution for your pet. Please let us know if you have any questions, or visit their company website, wwwroyalcanin.us to learn more about their diets.